In the next installment in the Modern Library Reading Challenge, we tackle Salman Rushdie’s Midnight’s Children! It is somehow appropriate to announce, on the 235th anniversary of my nation announcing its independence from Great Britain, my independence from Salman Rushdie. Midnight’s Children is Rushdie’s allegorical novel about India declaring its independence from Great Britain. My announcement is buttressed by the fact that Rushdie himself is British and presently living in the city I happen to live in, albeit in a less interesting borough than mine. Ultimately, one must separate the art from the artist. Patricia Highsmith preferred the company of animals to people, and was cruel to many. Norman Mailer stabbed his wife. Knut Hamsun sent Goebbels his Nobel Prize as a gift and called Hitler “a prophet of the gospel of justice for all nations” after his death. Yet in Rushdie’s case, it has been difficult to draw the distinction, in large part because Rushdie himself is (a) a study in contradictions and (b) not yet dead. 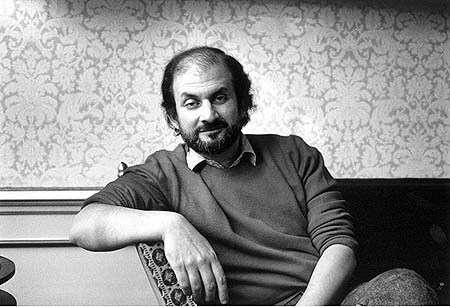 The man has sometimes proved so humorless that, when Insulted by Authors‘s Bill Ryan approached him for an insult, the good-natured literary enthusiast received this response from Sir Salman: “Well, why would you want to bring more insults on yourself?” And this seemed a needless extension of Rushdie’s efforts to enforce his will upon others. A few years ago, Rushdie caused Terry Eagleton to partially recant for taking him to task for his neoliberal imperialism. There have been lawsuits. On the other hand, Rushdie did support online criticism much earlier than one would expect from an apparent windbag. When I was 22, I read Midnight’s Children for the first time. I was seduced, like many young and impressionable readers, by the language. I also liked Shame and Haroun and the Sea of Stories. I thought The Satanic Verses to be a sensationalistic exercise. The infamous book had earned Rushdie a fatwā, resulting in many years of hiding (with a £10 million tab to UK taxpayers for protecting him over a decade) and a bizarre exchange of letters between Rushdie, John le Carré, and Christopher Hitchens over free speech. Then I read The Moor’s Last Sigh and was greatly underwhelmed. I had the sense that Rushdie’s big mammoth books were less about engaging the reader’s interest and more about forcing the reader to submit. Where was the Rushdie who had charmed in the earlier books? Still, I decided to give the man another chance. I read Shalimar the Clown and discovered a remarkably ho-hum book despite the promising title. I had observed Rushdie at a few literary events I had attended, seeing a man who appeared to be in love with himself. Since Rushdie wasn’t going away anytime soon, I figured the best thing to do would be to ignore the guy. Let the man stay busy with his half-assed involvement with politics and the film world. Let him have fun persuading supermodels and actresses decades his junior to hop into bed with him. It’s a free country. I didn’t need Rushdie. So I had thought myself done with the man. It had not occurred to me that Rushdie would pop up like some zombie surprise when I threw down the gauntlet back in January. Ultimately one must separate the art from the artist. And I cannot deny, in my thirties, that Midnight’s Children is a stylistically accomplished novel. If you know nothing about Rushdie and you are young and in need of patois, it will almost certainly fulfill a need. It is adept in stringing the reader along. Chapters begin with bold bursts of storytelling: “To tell the truth, I lied about Shiva’s death” and “No! — but I must.” So in Saleem Sinai, you have an unreliable narrator who is lying and twisting and inventing and rambling, but always giving you more. And by bringing in such side characters as the Brass Monkey begging, “Come on, Saleem; nobody’s listening, what did you do? Tell tell tell!” and in deftly deploying dependable tricks such as swapped babies and secret basements and political intrigue and creepy soldiers at tables and convenient coincidences, Rushdie’s gargantuan story reminds the reader that not only is this a story, but it’s a story familiar with story. There are indeed very few places in the book where I wasn’t aware that what I was reading was a story. But Rushdie is not a writer who I enjoy reading now. Perhaps it is because life is more than story. Or maybe I have reached a point where story is no longer enough to satisfy me in a novel. I confess that I had to take three twelve mile walks, dutifully flipping and sweating into the pages in the humidity, in order to finish this book. And even then, this eccentric form of self-discipline was countered by the many dogs, kids, and people who I talked with along the way — all of whom proved more worthy of my time and more interesting than Midnight’s Children. The issue is not India’s marvelous history. Before rereading Midnight’s Children, I decided to read an enormous book (Ramachandra Guha’s India After Gandhi), which outlined the great nation’s vivid history in remarkably clear and quite interesting detail. I figured that knowing more about Nehru and Indira and Sanjay — to say nothing of the Kashmir conflict, the battles with China over Tibet, and the wars with Pakistan — would give me additional insight and interest into Rushdie’s carpet bag. And yes indeed! I became very excited to step right up and enter Rushdie’s rollercoaster. Until I realized the lack of tensility in the track. The issue is not my mixed feelings about magical realism. I should probably confess that, while I’m almost always game for fantasy and speculative fiction and Murakami’s surreality, magical realism has felt like a cheat to me. Yet in revisiting the Midnight’s Children Conference, Saleem Sinai’s nose, and his ability to clamber inside other people’s heads, I found these portrayals justifiable because Rushdie remained fairly fluid with his allegory. Rather, the issue is Saleem/Salman’s desperate need to be liked, to smother the reader into a participatory role rather than that of a peer or a fellow adventurer seeking mystery and ambiguity. Back in 1981, Rushdie’s hey presto smashing mingling mixing form of writing was fresh and innovative: a defiant assertion from a wily wordsmith sticking up for his needlessly neglected home turf. independent: adj. 1. not influenced or controlled by others in matters of opinion, conduct, etc; thinking or acting for oneself: an independent thinker 2. not subject to another’s authority or jurisdiction; autonomous; free: an independent businessman. In 2011, I am neither especially old nor especially young. I was born in the state of California…once upon a time. No, that won’t do. There’s no getting away from the book. In Midnight’s Children, Saleem declares “…in autobiography, as in all literature, what actually happened is less important than what the author can manage to persuade his audience to believe.” Rushdie has denied that Midnight’s Children is a historical novel in numerous interviews. Is belief the only quality that remains? Aadam Aziz, Saleem’s grandfather, is separated from his friends by “this belief of theirs that he was somehow the invention of their ancestors.” And yet belief related to birth is both problematic and ugly, as when Saleem states his “belief that Pavarti-the-witch became pregnant in order to invalidate my only defense against marrying her.” Then there is India’s “national longing for form” — “perhaps simply an expression of our deep belief that forms lie hidden within reality.” The midnight children do eventually lose belief in the very mechanism Saleem creates for them. So if belief in Midnight’s Children cannot be tied to history, cannot be tied to people both real and imagined, and cannot be manifested even in the positive events that Saleem describes in hindsight (even the ones that result in betrayal), why then should we believe in Saleem? Why should we believe in Rushdie? It seems to me that what I have been protesting through this essay — admittedly in the manner of an easily distracted tap dancer who longs for another ballroom — is not so much the idea of a novel reframing intricate history in a quirky and robust manner (which Midnight’s Children does quite well at times), but the troubling notion of Saleem (and by extension Salman) refusing to believe or burrow into belief. So if Rushdie sees culture, both religious and secular, as mere mechanical strata to pluck and claim as his own, then perhaps I’m objecting to his inherent insensitivity: his brazen ownership of other people’s ideas without recognizable deference to the originators. But in claiming ideas so totally in Midnight’s Children (an admittedly admirable performance), I don’t think he leaves nearly enough for the reader. Next Up: Henry Green’s Loving!